My friend, Don Carey, has written a book. Fabulous, no? He recently sent me a copy and is also allowing me to participate in his blog book tour. Bumpy Landings is an appealing debut novel. It takes place in my home town, Laie, Hawaii, and every page was a plumeria perfumed, stroll down memory lane. All the references to Brigham Young University - Hawaii, the LDS Temple and various spots around the State, reminded me of my very happy childhood in that loveliest of places. Having said that, I must point out, familiarity with Hawaii is not necessary to find Bumpy Landings an engaging and charming read. Carey manages from the very first page to make the setting of his novel come alive. One can almost hear the tradewinds rustling through the palm trees and taste the local delicacies described within. Jordan, the protagonist, is recently returned home to Laie after serving a 2-year mission for the Church of Jesus Christ of Latter-day Saints. He is excited to be home, but has some reservations about what his future holds for him. In this classic coming of age tale, Jordan navigates his way into adulthood with the usual fits and starts that characterize such a journey. Along the way he must decide who he is and who he wants to become, while simultaneously acknowledging that the decisions he makes affect more that just his own life -- a critical theme expertly tackled by Carey. Jordan is a passionate and extremely believable character who plunges headlong into his post-mission life. He falls in love with not one, but two girls and the reader is left wondering until the very end how that plot line will resolve itself. Jordan's love interests, Heather and Kehau, show him the true meaning of love and force him into some very adult situations that provide the basis for much of the novel's conflict. You'll have to read the book to find out if he gets the girl. Seeking to honor the memory of his deceased father, and against the express wishes of his domineering, yet obviously devoted mother, Jordan pursues his dream of becoming a pilot. Carey is not a pilot, but it is hard to believe that as he describes in such vivid detail the unbridled joy Jordan feels while soaring through the air. I found myself wishing I were sitting in the cockpit with him as he piloted his tiny plane between the lush islands in the Hawaiian chain and over the cresting waves of the Pacific. Bumpy Landings is a fun read and an especially welcome respite from the bleak cold of the season. Carey's characters are robust and interesting and the reader can't help but root for Jordan, even when he finds himself in difficult predicaments of his own making. The plot is well-developed and absorbing. I enjoyed this book and would recommend it to anyone looking for a little mid-winter escape to the islands. 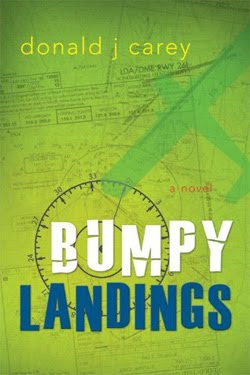 Purchase your own copy at DeseretBook.com or Amazon.com and start reading Bumpy Landings today. I really apprecite book reviews...so neat that you know the author. Linsey, thanks so much for being a part of the Bumpy Landings blog tour. I'm glad you enjoyed the book, and hope your virtual vacation can keep you warm the rest of the winter! It's always interesting to me how people handle their post-mission life. I haven't gotten a chance to read this book yet, but I'm excited to. Gotta love the LDS books!